Everyone knew that, in the weeks before Christmas, the place to find Alene DeBrito was in the kitchen. She'd be making her chocolate-dipped, dried apricot candies for the friends, employees and customers of her husband Arnold's farm implement business. It didn't take too long before things got out of hand. Demand exceeded Alene's ability to supply. So as not to disappoint those recipients who year after year had come to anticipate the heady taste of chocolate and apricot, and so as not put Alene and the family in a tizzy every November, there was only one thing to do - build the Chocolate Factory. The end result of that decision is presented here; quality chocolate, California dried fruit, fresh nuts-combinations that can make you feel good about indulging. We know you will enjoy our fine chocolates just as much as if you snatched one fresh from Alene's kitchen table. 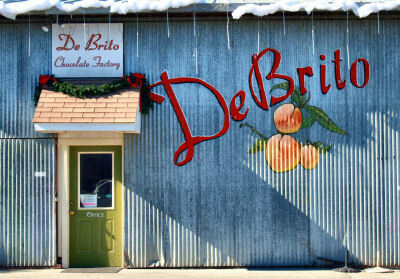 Come see how DeBrito Chocolate Factory creates all of their yummy candies. Tours are conducted with groups of 30 or more and begin at 9:00 am. Call us today to schedule your tour appointment at (800) 588-3886.